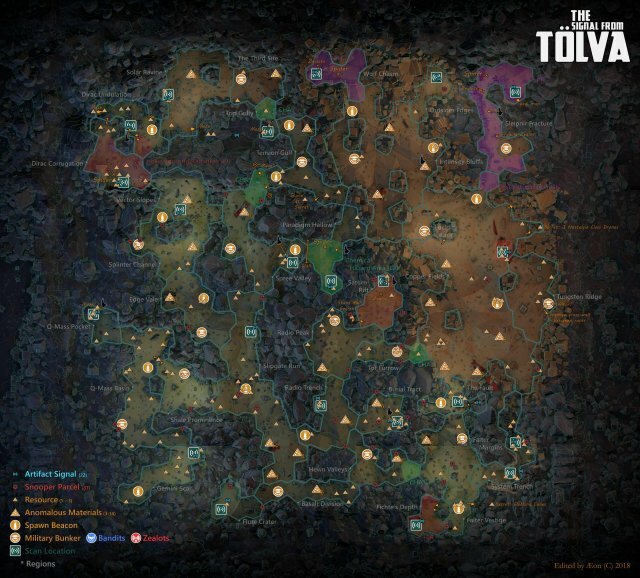 A detailed world map for The Signal from Tölva showing all Artifact Signals, all 37 Snooper Parcels, the exact locations of Resource items, and even several places of confirmed "Ghost" sightings. Additionally secret areas and how to reach them are marked on the map. And a few other nifty tips have been added, like the locations of all "Spiders". All this should help when trying to collect the Steam achievements. For convenience, all the regions are named on the map. This can slightly help find all of them for the Traveller achievement. Also named are the hazard areas that require a specific level of hazard suit to enter them. A suit upgraded to level 1 lets you enter the red'ish Heavy Ionizing Radiation areas; a level 2 upgrade opens up the green'ish Chemical Hazard areas; and finally at level 3 the purple'ish Psionic Hazardareas become explorable. Even though the Scan locations are clearly marked by the game, the actual exact location of the Artifact Signal is not. Quite often the artifact is quite a bit away from the game's marker. For those trying to get the snooper achievements: Surveyor, Grand Surveyor and Master Surveyor, all 37 Snooper Parcels have been clearly marked. All the Resource locations (I found) have been marked. This should help collect the 100-400 resource fragments required for the Gatherer, Provider and Hoarder achievements. Also see the Anomalous Material markers for additional resource fragments. 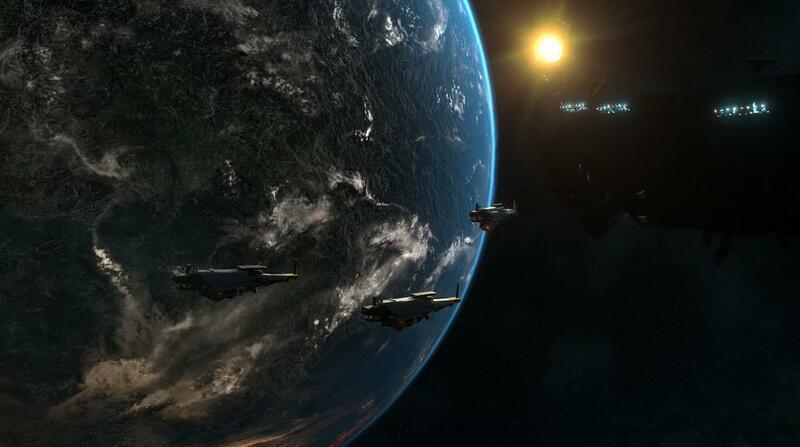 The game already marks the Anomalous Material locations, I added resource fragment countersto these markers. It can be tricky to notice the "Ghost" appearances in the game. Apparently they show up near Artifact Signals. I marked those that I could verify, though there seem to be more. Should help to get the Spook achievement. The Military Bunker markers should help get the achievements: Soldier, Warrior, Warlord and Overlord. The Spawn Beacon markers should make it easier to find every marker beacon for the achievement: Messenger. To make it easier to get the Kill It With Fire! achievement, I marked all the Spider locations. There are three interesting secrets areas in the game, these have been marked, plus arrows denote how to get to them. A few other things of note: places I was able to "exit" the map or non-hostile praying Zealots. As a reminder, the Mazes in the game have also been marked. This should help "grind" the achievements: I'm Not Lost, I Might Be Lost, and Okay... I Am Lost.